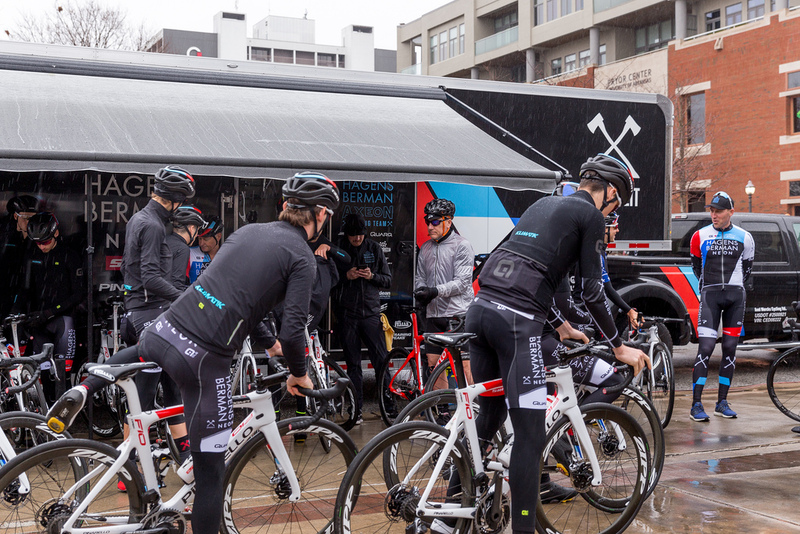 Hagens Berman Axeon director Axel Merckx (far right), watches as his pro continental cycling team prepares for a morning ride on the downtown Fayetteville square. Hagens Berman Axeon, led by Belgian former pro bike racer Axel Merckx, aims to develop talented young riders under the age of 23 into professional athletes who compete at the highest level. 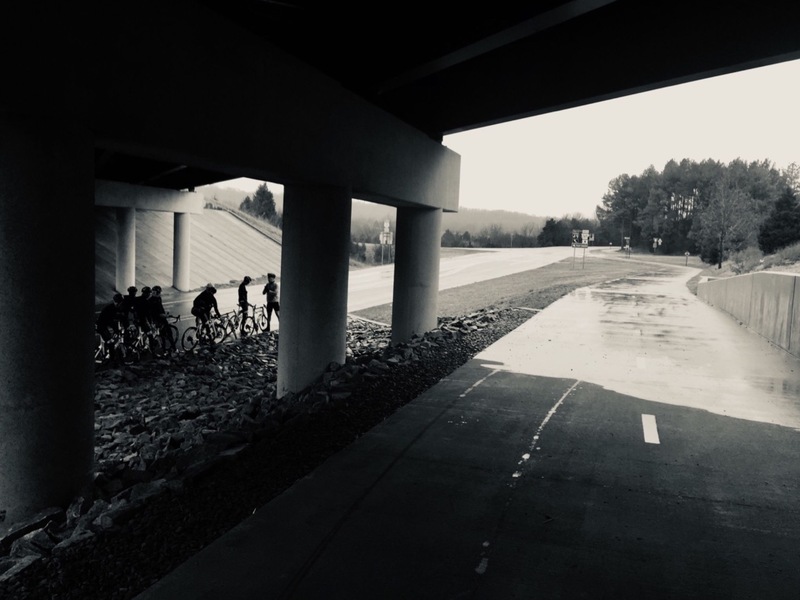 The group arrived in Fayetteville in late January for 10 days of riding and camaraderie-building in preparation for a season of racing across North America and Europe. The team was brought to town with help from Experience Fayetteville, the city’s tourism bureau, which has recently put a focus on promoting cycling in and around Fayetteville. 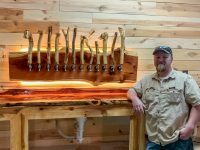 Rawn said the team’s social media following and the coverage that occurs as a result of working with pro riders should draw new attention to Fayetteville and tell a powerful story to the rest of the cycling world. It’s good timing, too, as Fayetteville was just selected as the site of the 2022 Cyclocross World Championships. It will be just the second time the United States has ever hosted the event, which was first held in 1950 in Paris, France. The team stops at the Fulbright Expressway underpass on Hwy 265 in south Fayetteville. For their part, Experience Fayetteville helped the team coordinate lodging arrangements, meals and other planned activities. Rawn’s office also assisted with travel arrangements and helped with on-site logistical support. The region’s hilly topography also played a role in luring the team to Fayetteville. Merckx is no stranger to riding on tough terrain. He won the Belgian national road race championship in 2000 and a bronze medal at the 2004 Olympic Games in Athens. His father Eddy is a five-time Tour de France champion. Nick Shuley, the team’s marketing director, said finding good places to ride was simple. The “Winslow Death March” is a popular local cycling route with challenging climbs and great scenery. That’s partially because some of the riders were already familiar with the area from past participation in the Joe Martin Stage Race. 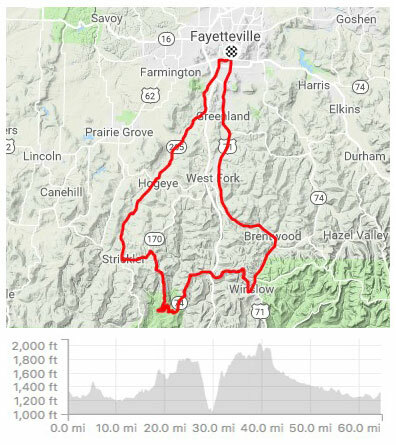 The annual event is one of the longest, continually held cycling races in the United States, and typically brings over 500 athletes from 24 countries to Fayetteville each year. Shuley said the Joe Martin race organizers were also a big help in sending the team in the right directions for its daily rides. 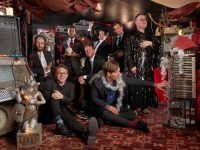 The group logged nearly 500 miles and climbed over 30,000 feet during the camp, according to data on the riders’ Strava profiles. The week’s rides took the team through some areas that are well-known to local cyclists, including Hogeye, Black Oak and a variation of what’s commonly referred to as the “Winslow Death March,” a challenging, 65-mile route with several sustained climbs featuring a scenic descent into Devil’s Den State Park and a long climb back out. When the weather dipped into the teens late in the week, the team stayed inside and participated in a virtual race on indoor trainers at the Chancellor Hotel. Hagens Berman Axeon is one of four pro cycling teams to take part in the Kiss Super League, the first dedicated e-racing league for pro riders held this year via the popular online training platform Zwift. Rawn said although Experience Fayetteville has had no specific discussions with the team about future training camps, she would love to have them back in town next year.